It’s that time of year—when the chilly air fills with holiday scents like cinnamon, pumpkin spice and sugar cookies! 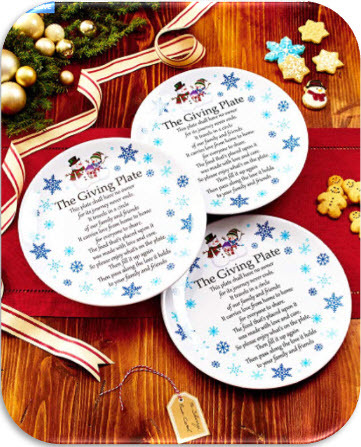 Many of us who may not bake during the year will bust out the pans and cutters to bake something special during the holidays. 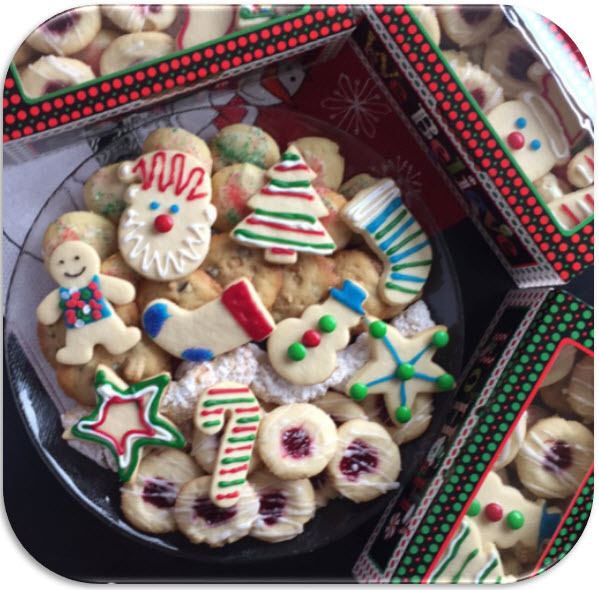 It’s a great feeling to hand out our homemade treats to friends, family and neighbors! 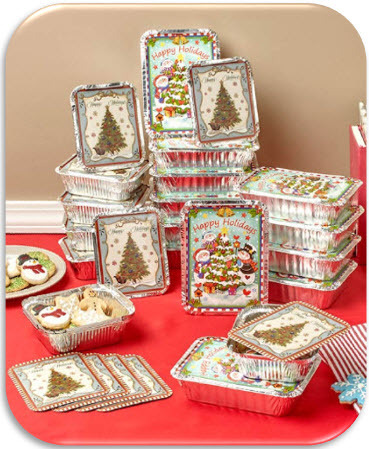 Our Set of 24 Holiday Goodie Containers make the perfect packaging for the treats you bake. Now that you know how to wrap up your treats, it’s time to figure out what cookies to bake—after all, you’ll have 24 goodie containers to fill! Here are four holiday cookie recipes to try. While oven is warming to 350°, cream the butter and sugar in a mixer until smooth. Mix in the egg and both extracts. In a separate bowl, combine the baking powder, salt and flour. Add the dry ingredients slowly into the wet ingredients. Note — knead by hand if the dough gets too stiff for your mixer. Take a portion of the dough and roll it out on a floured surface to cut. Keep the cookies around ¼” thick. Bake for 6 to 8 minutes and transfer to a cooling rack. 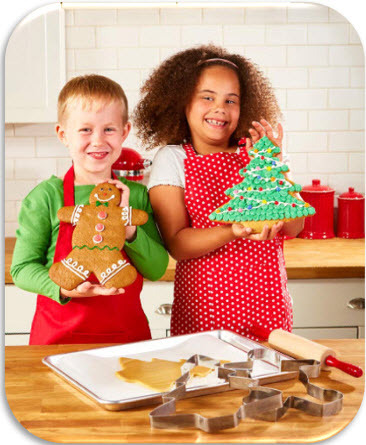 Once your cookies are cooled, it’s time to decorate with colored frosting, however you choose! Stir together the flour, cornstarch and salt. Set this mix aside. Cream the butter, sugar and almond extract together until smooth. Add the dry ingredients slowly into the wet ingredients, and refrigerate covered dough for 1 hour. While oven is warming to 350°, line a baking sheet with parchment paper and shape dough into 1” balls. Place 2” apart on the baking sheet. Make an indentation in the middle of the cookie with your finger and fill the well with ¼ teaspoon of jam. Bake 11 to 15 minutes until edges are lightly browned. Combine all glaze ingredients with a whisk and drizzle over cooled cookies. Stir together the flour, baking soda, baking powder and spices. Set this mix aside. Cream the butter and sugar together until smooth, then beat in the egg and vanilla. Scoop the dough into 1-1/2” balls. In a small bowl, mix all of the rolling powder ingredients. Roll your dough balls in the powder and set your cookies on a cookie sheet. Bake at 375° for 10 to 12 minutes, removing just before the edges brown. While oven is warming to 350°, cream the butter, dry pudding mix and sugar in a mixer until smooth. Mix in the egg and both extracts. In a separate bowl, combine the baking powder, salt and flour. Press dough into the bottom of a greased 9” x 13” pan. Bake for approximately 20 minutes, until lightly brown at edges. Beat cream cheese and butter in a small mixing bowl until smooth. Add remaining ingredients and beat until smooth and creamy. 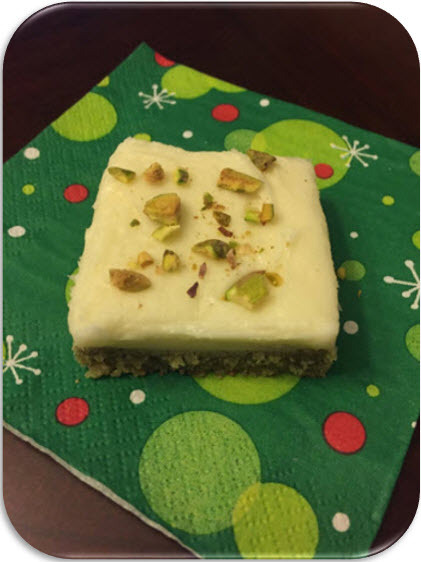 Spread frosting over cooled cookie, sprinkle pistachios on top and cut into squares for serving. We all know that while baking it’s hard not to tempt yourself with trying out the finished products (or the sugary dough during creation). 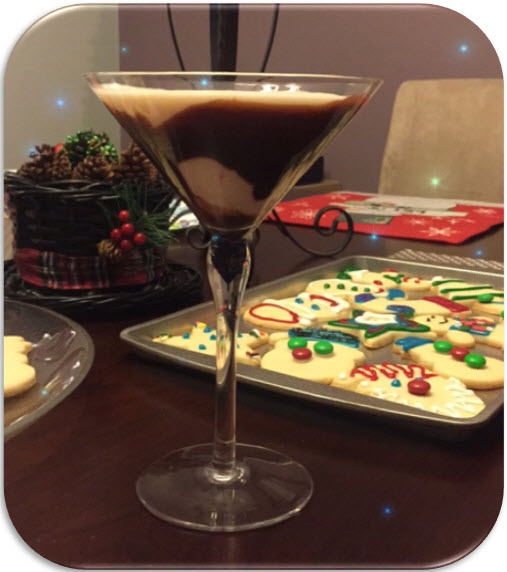 Whether you’re sipping a glass of milk, egg nog or a holiday martini (pictured), make sure you sit back and indulge on the tasty treats you just created. Just save some for the neighbors! recipe doesn’t list in the ingredients how many eggs and how much vanilla. Hi Judi – Please accept our apology for the mistake, as well as for this late response. The Raspberry Shortbread recipe doesn’t include eggs and vanilla. We’ve updated the recipe accordingly.